According to Time Magazine, in 1812, the year Charles Dickens was born, 66 novels were published in Britain. Many were written by “Anonymous,” since novels were not very reputable. No one dreamed of making a living writing them. Dickens, the first literary celebrity, whose bicentennial we celebrate this year, was instrumental in changing that, but he never could have imagined today’s literary landscape, which his work helped to create. Mark Coker, guest speaker for January’s California Writer’s Club lunch, described an experience that is emblematic of the challenges faced by new writers today. Coker and his wife co-wrote a novel. They went through the revision process, and eventually became clients of a prestigious New York agency. Two years later, their book remained unsold. 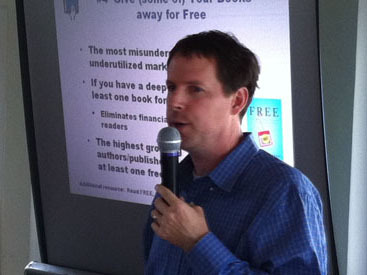 Coker’s solution was Smashwords, an ebook publishing service he started in 2008 that is at the forefront of changes rippling through the industry. Coker says that large publishers “look in the rearview mirror” for what has worked in the past. There is little financial incentive for them to risk new concepts and new authors. Even an author who wins the publishing game and gets a book on the shelves has no guarantee that a title with slow sales will not be remaindered within a matter of weeks. That may not be enough time to establish the buzz that drives success. Publishing on Smashwords is free and fast. Correctly formatted books are distributed to all the major ebook publishers, and authors receive 85% of the sales. Books do not go out of print, so there’s time for word of mouth to evolve. Smashwords usage is growing exponentially. Authors uploaded 140 books in 2008. In 2011, the total was 92,000. Coker’s talk was animated with a sense of mission. He said what gets him up in the morning is, “enabling writers to express themselves.” He never suggested it’s easy, however, and most of the rest of his presentation detailed what is required. First in importance, of course, is a really good book. Coker suggested as many revisions and beta readers as necessary, and possibly professional editing. At stake is the trust of readers, hard to build and easy to lose. Next in importance are a well designed cover and compelling blurb. Coker says polls reveal that “discovery” accounts for 50% of ebook sales – in other words, we still buy books by their cover. This is good news for indie authors. Only 18% of readers polled reported sticking with authors they know. This means that for independent authors without design skills, hiring an artist is almost essential to come up with a cover that will capture attention as readers scroll through pages of thumbnails. An email to list@smashwords.com will generate an auto reply listing 3d party artists and people who handle format. Coker presented more information than I can cover in one article. He has free guides to ebook formats and marketing at https://www.smashwords.com/. Other topics are covered on the Smashwords blog, (referenced on the blogroll here) and at http://www.huffingtonpost.com/mark-coker. With ebook sales continuing to climb; with Apple’s move into electronic textbooks; with Smashword’s impending foray into library distribution, it becomes increasingly clear that ebooks are where the future of publishing lies. Mark Coker used the phrase, “democratization,” which again brought to mind the Time article on Dickens I referenced to begin post. This entry was posted in Authors, Books, Publishing, Writing and tagged authors, books, ebooks, editors and agents, publishing, writing. Bookmark the permalink. Fascinating — thanks for sharing this information with those of us who couldn’t be there! You’re very welcome. This was just an introduction, with so many subtopics untouched. For instance, ebooks seem to be an excellent medium for certain “How To” books, a large subject in itself. Thanks for stopping by. This is great, Morgan. So helpful. Thanks for such a useful post. You’re welcome. I was really glad to be able to attend.